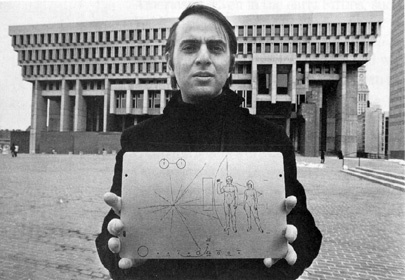 Carl Sagan holding the Pioneer plaque. If you know who the photographer is please let me know. The successor to Carl Sagan’s classic work of education about the cosmos — the universe seen as a well-ordered whole — begins tonight1. Here’s a trailer2. The original is as relevant today as it was thirty years ago and if you are at all interested in the greatest of questions and grandest of mysteries please watch the series and read the book as they complement each other perfectly. Sagan’s work is certainly one of my touchstones.